Our new staff have now been in place for nearly 3 months and the project is fully up and running! Cordelia has already given the project an identity, with our fantastic project logo. Norfolk show – The team attended the Norfolk Show in June and it was a great success. Cordelia produced fantastic banners, a broads backdrop (for authentic selfies! ), laid on colouring and painting activities for children and generally produced an excellent stand. Even Prince Charles cast us an approving glance as he wandered past! Public reaction to the project was very positive, with many “locals” saying they had not visited before but would definitely put the Nature Trail on the list of places to visit over the summer. 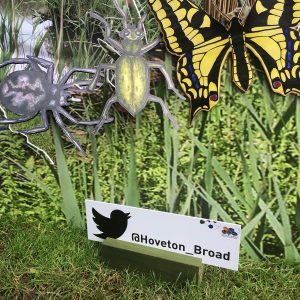 Social media – We’ve launched our twitter account – @Hoveton_broad and already have over 150 followers. We’ve also submitted an entry for the Natural England external blog – due to go out any day now. The project gov.uk web page is also now live. Graftas – Rick, Jean, Dawn, Carolyn and Chris all attended the Graftas, with the project nominated in the Effective Engagement category. We didn’t win but it was an achievement just to be short-listed and we enjoyed a lovey walk at the WWT centre at Barnes. Lake Restoration – Chris and Rhiannon – with the help of Netics – are working hard to ensure that we go out to tender for the mud-pumping contract by the end of July. Works are due to begin at the start of November. Access and Engagement – Cordelia is producing an updated access and engagement plan, ready for the HLF monitor’s visit on 19th July. 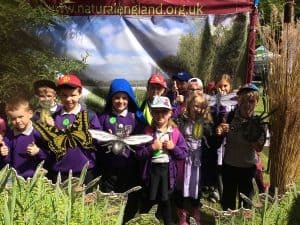 She’s also working with the Salhouse Broad Team to set up a regular ferry service from Salhouse Broad out to the Nature Trail, starting 14th July, running every Thursday to Sunday every half hour, 10am to 4pm over the entire school summer holiday. Finance – Julia is busy taming SOP( Government Accounts system), and doing a fantastic job brining our financial records up-to-date. Beware anyone who forgets to submit their timesheets! HLF monitor’s visit – Our HLF monitor, Claire Thirlwall, will be visiting the site and meeting some of the team on Tuesday 19th July. Rick has already arranged perfect weather and Elaine will no doubt be polishing the Norfolk Hawkers, ready for inspection. Green letter day – Elaine is currently organising dates for Himalayan balsam pulling. Please make a note of the 28th July and the 11th August and attend if you can. Team catch-up – Jean is looking to arrange a half-day get-together for everyone regularly involved in the project. This will give everyone a chance to reflect on how things have gone so far, comment on how they are feeling and make suggestions for how to improve things in future. November Reporting – Our first report to Life is due in November. Chris will soon be casting his eye over the template and is likely to ask everyone to contribute in helping to tell Life what we’ve been up to. If you have any suggested content for future Team Updates or have questions about anything you’d like to know more about, please email Chris or Rhiannon.